"The walk from the station takes about 20 minutes. The following route may seem a little complicated but should be easy to follow once you are on your way! Although the distance to the ground is not far "as the crow flies" there is no direct road or bus service. Leave the station by the main entrance where the shops and ticket office are located, not by the Pride Park entrance. Turn right and proceed along the road, past the car park and office buildings until the pavement goes under a flyover. Turn left following the sign for the City Centre. Continue along this pavement until it turns right and crosses a short stretch of the Derby Canal. After crossing the canal carry straight on and follow the path as it goes alongside the River Derwent. Take the first bridge across the river and then turn left passing in front of the Evening Telegraph building and the Bus Garage entrance. Take the road on the right walking along the side of the Bus Garage and follow the pavement around to the right as it goes behind the Bus Garage, then under the railway and along the by the side of the A52. Keep going until you reach the Pentagon Island with the Peugeot garage on your right. Carry on across the road ahead with the double pedestrian crossing and then carry on ahead with Kwik-Fit and the car wash on your right. At the far corner of the car wash, cross the slip road and pass under the flyover carrying the A52. Cross the next slip road and then carry straight on with the Pentagon Trade Park and Speedy Hire on your right. Cross the next road and you have arrived." Used to resemble a not-very-prosperous village club, but now improved as millions have been spent on new facilities. 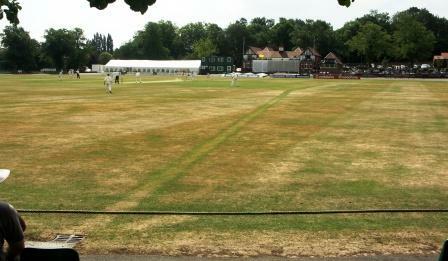 The pitch inspectors have penalised Derbyshire for poor pitch quality several times. The east-west alignment of the pitch meant that sometimes play stopped in the late afternoon because of too much light, but the alignment was changed to north-south after the 2009 season. About a mile from the station. Head south past the twisted spire, then turn right along the busy Markham Road towards the park. A circular ground ringed by tarmac pavement.